Rev. Fr. Evaristus Bassey, Executive Secretary of Caritas Nigeria, has called on government to partner religious bodies in order to achieve the Post 2015 Sustainable Development Goals (SDGs). Caritas is an agency established by the Catholic Bishops Conference of Nigeria (CBCN). It is a specialized vehicle for human development with a mandate to coordinate the social interventions of the Catholic Church in Nigeria. According to him, based on the experience of the United Nations Development Programme (UNDP), it had established guidelines for engaging faith based organizations and their leaders and government needed to adopt those guidelines. Rev. 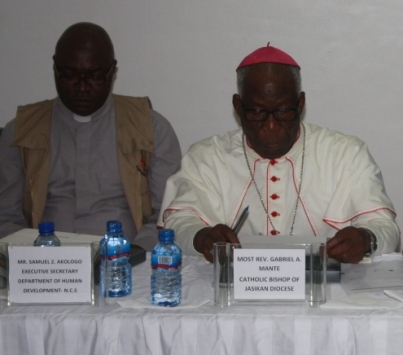 Bassey was speaking at a two-day forum on the theme: ‘Responding to Challenges and Opportunities of the Post 2015 development Agenda- Role of Catholic Development Organisations’ in Accra recently. He said though there were 17 goals and about 169 targets on SDGs, the Church together with government needed to prioritize on goals that would properly fit into the relevant development agenda to achieve sustainable results. Nii Moi Thompson, Director-General of the National Development Planning in a statement read on his behalf recalled that the UN Conference on Environment and Development (UNCED) held in Rio de Janeiro, Brazil in 1992, set up a global developmental agenda for the 21st century, called the Rio Declaration or Agenda 21. He disclosed that a global development agenda known as the Millennium Development Goals (MDGs) were set up to achieve a number of global targets by 2015. The Rio+20 outcome document, ‘The Future We Want,’ inter alia, called for the establishment of an Open Working Group (OWG) to develop a set of post-2015 global development agenda called Sustainable Development Goals (SDGs) for consideration and appropriate action by the United Nations General Assembly at its 68th session. “This process would be rolled over into Ghana’s long-term development for 2016-2056 which was currently being developed, adding that the existing cross-sectoral planning group which discusses various themes of the Ghana shared growth and development to ensure consistency, would be strengthened to include other stakeholders apart from government,” he added. The forum which was organised by MAREDES, Catholic Relief Agencies, Caritas Africa, and the Catholic Bishops Conference, among others, brought together 20 Diocesan Development offices of the Ghana Catholic Bishops Conference, Catholic Development Partners from Germany, England and USA, Caritas Member-Organisations from Tanzania, Kenya, Nigeria and Sierra Leone as well as representatives of the symposium of Episcopal Conference of Africa and Madagascar.